Garth Studio at Garth House in Brampton, Cumbria sleeps 2 people. Garth House in Brampton is situated within the market town of Brampton; these two lovely properties, close to the owner’s home, provide welcoming and comfortable holiday accommodation, perfect for a relaxing break away. Garth Studio (ref UKC3329) is the ultimate luxury, romantic getaway! The property is open plan throughout, with attention to detail at every turn, from the sumptuous bed with feather soft pillows, to the last word in luxury – the huge deep bath at the end of your bed. After a busy day, why not sit under the stars and relax in your very own hot tub? The renovated apartment provides a contemporary and luxurious venue for that extra special romantic break. Garth Cottage (ref UKC3330 [Garth Cottage]) certainly has the wow factor! This renovated cottage is elegant and stylish, and from the moment you walk through the door you won’t be disappointed. It is perfect for all the family, with the rooms flowing through from the kitchen leading into the dining room, through to the living room and finally the conservatory. This property provides a variety of extra special touches, from the large 55” curved TV, the voice activated Bang & Olufsen hi-fi, the luxurious beds and sumptuous pillows, to the large deep baths. Outside is just as impressive with your very own hot tub! The location is perfect to for exploring the beautiful Cumbrian countryside. Take a leisurely walk down into town, or within a few miles Gelt Woods is a delightful walk. A must in the area is a walk along parts of Hadrian’s Wall. Further afield, visit the delights of the Lake District National Park or cross the border for a scenic drive into Scotland. There is a shop, pub and restaurant 500 yards from Garth House in Brampton. Garth Studio is all on the first floor. Living area: With 55 Freeview curved TV, DVD player and CD player. Bedroom area: With super king-size bed, bath and en-suite with shower cubicle and toilet. Biomass central heating, electricity, bed linen, towels and Wi-Fi included. Welcome pack. Courtyard with sitting-out area and garden furniture. Bike store. No smoking. Holidays at Garth Studio, Garth House run from Friday to Friday. For a better idea of where Garth House - Garth Studio is, you can see Garth House - Garth Studio on the map below. Garth House - Garth Studio is in Cumbria; should you be on the lookout for a special offer, you can find all the special offers in Cumbria. It's always worth checking to see what is on offer at the moment. 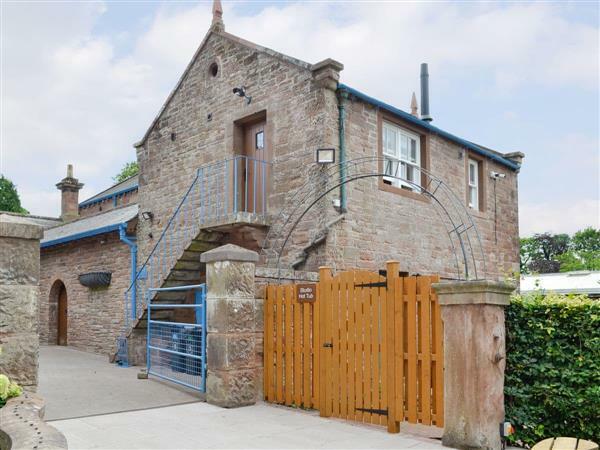 Do you want to holiday near Garth House - Garth Studio (UKC3329), you can see other cottages within 25 miles of Garth House - Garth Studio; have a look to find your perfect holiday location.